Social Media Marketing has become the new means of communication for business products and services. Over the years, rebranding has been a necessity for me as I have had numerous entrepreneurial projects, some at the same time and others at different times. It has been crucial that each looks not only like what it is but that it is different from another project. Rebranding involves primarily two distinct elements, visual and verbal. In other words, a rebrand will include changes in words, the name of a company, its tagline and mission. Equally important is the visual change, a new logo, a different color scheme and typefaces. These ideally have the feel or spirit of what the company or project itself is about. 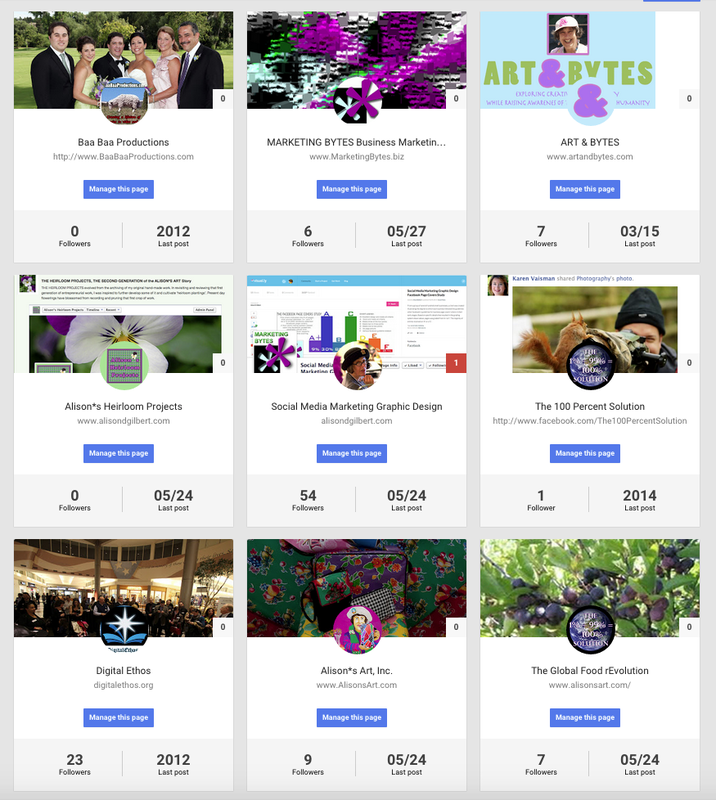 The sampler of some of my business Google+ pages illustrate these points. I have rebranded myself as many times as I have changed entrepreneurial projects. That includes more times than I can provide examples, here. Now, as an officially retired person, I still need a new brand. The reason for that is because I have reached the point where I am my brand. I have become something of a media personality. My ‘product’ is me. My brand is myself. Facebook pages are a clear way to understand the differences in my brands. This Facebook page has a photo of me as the icon. It clearly shows whose page this is. My last project ART & BYTES has a very different brand, visually and verbally. Take a look at it below. The above Facebook page has a totally different brand. It starts with the color scheme. Light blue rather than yellow is the primary color. The typeface is totally different. The icon is an ‘&’ playing on and emphasizing the name, ART & BYTES. The challenge of creating the ART & BYTES brand was that this project was a combination of all my previous work. It was designed as an archive of all my work in MARKETING BYTES and ALISON*S ART. This my goal was to create a brand that would combine both and yet maintain its own identity. MARKETING BYTES came right before ART & BYTES. Below is a sample of one of its social media headers, the blog post header. Notice there is another icon, a different typeface and a different image of me. There is some similarity to the color scheme of ART & BYTES. But the two brands clearly are different. Examples of Rebranding: ALISON*S ART, INC. 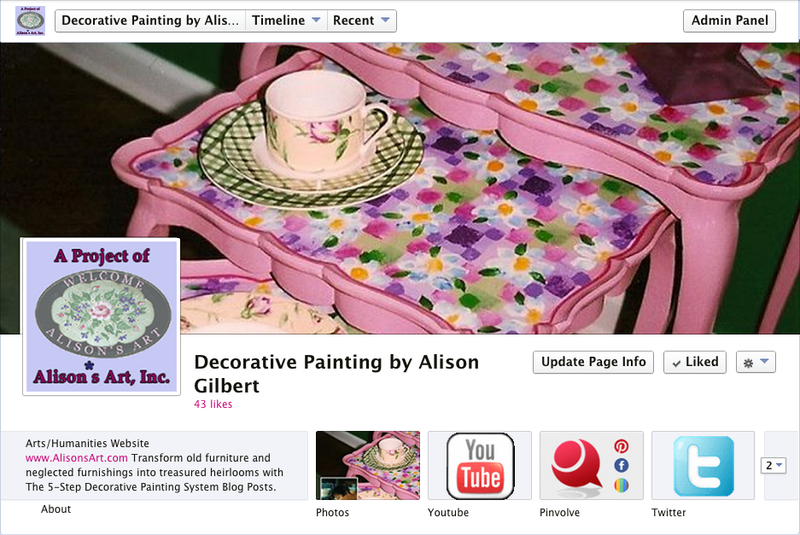 The last example of one of my brands is from a project of Alison’s Art, Inc. It was Decorative Painting. Below is a facebook page from that enterprise. The icon is quite complex. It has unique colors, shapes, images, type and is totally distinguishable from all the others. In fact the oval pattern was the original Alison*s Art logo that became the foundation for all my art projects. Decorative Painting was one of those projects. I would like to demonstrate the distinction between several of my brand by exhibiting both photo and logo icons. Clearly each is distinct. But at the same time there may be some similarity having been created by the same hand and a singular design sensibility, mine. At the same time, I think there is enough uniqueness to clearly demonstrates rebranding several of my projects. 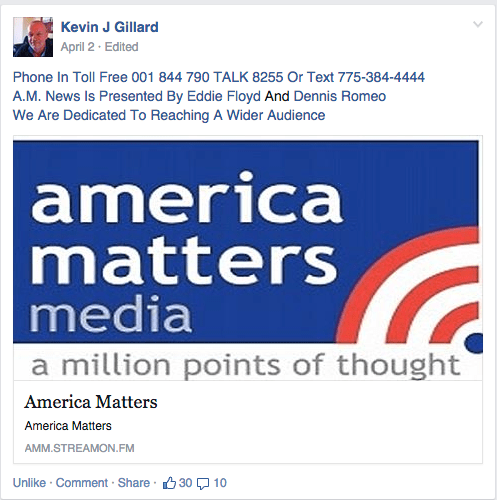 I became an A.M. News on America Matters Media Correspondent on February 10, 2015, only two months and a few days ago. I had no idea how much starting my day with one simple phone call would elevate my life to such a joyful place to start each day. A.M. News Host, Eddie Floyd and A.M. News co-host Dennis Romeo have created a warm, entertaining and informative format. It is very simple to become a correspondent. First, ‘Listen Live’ online at amm.streamon.fm. The show is on from 6 am PT to 9 am PT or the equivalent in your own timezone. Once you have a feel for the content and pace of the show, call in toll-free at 844-790-8255, text, 775-384-4444 or facebook message on A.M. News On AmericaMatters.US. You will be given a correspondent number. We have both United States and Foreign correspondents. Everyone shares their first name, where they are from, the local weather, their local events and their personal activities, too. I get to share my specialty. I am the ‘Healthy Living’ Correspondent. There is an intense interest in learning about nonprofit activities and organizations around the world that correspondents as well as listeners can participate in. Many nonprofits have gotten exposure and support by joining the show. People needing prayers are welcome to call in for help and support. The show has become a loving, caring, informative community of ‘local-global’ neighbors. A.M. News, online radio, makes the most of the latest in social media technology. There is a facebook group, listing as many correspondents as possible. The image below shows what a correspondent listing looks like. There is a correspondent post and then room for commenting by both the correspondent and others. There is also an A.M. News facebook page that is posted to daily by our hosts, with information about the show, specialty facebook pages like Truckers, Troopers and Lady Law Enforcers shown below, an America Matter Media website and more coming. 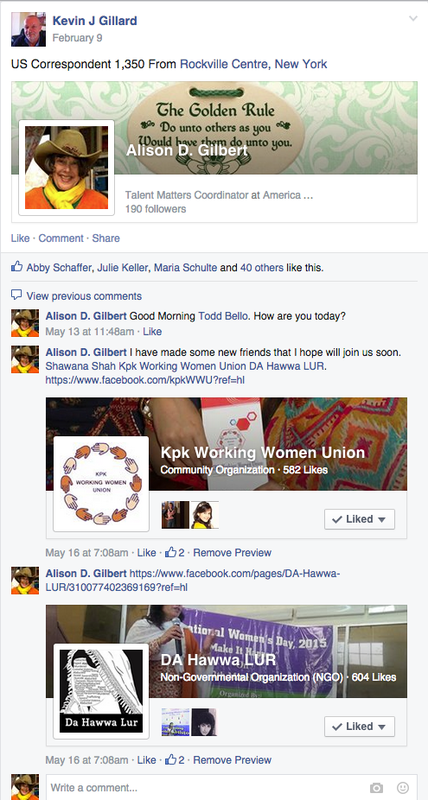 Alison D. Gilbert post and group comments. There are over 1,600 correspondents from around the globe. We learn about people that we would otherwise never meet. We are updated with local news, globally. We support nonprofit organizations that are run by our correspondents and we connect with each other outside of the show. There are also 1.5 million listeners who benefit from listening to our show. Our group of worldwide correspondents have become like a family. Correspondents have become good friends. We are in touch outside of the show. Some of us are even on other americamatters.us shows as well. We are also planning to have our 1st Annual Correspondents Convention in Reno, Nevada as soon as we can organize it. We have also formed correspondent groups that fit into special, specific categories. One of those, displayed as a facebook page, is Truckers, Troopers and Lady Law Enforcers. Teresa’s Garage on america matters media, part of NEVADA MATTERS INC.
Teresa’s Garage is dedicated to helping women learn more about automotive care. The reason it is being mentioned on this post is because Teresa’s pit crew are all correspondents of A.M. News. Teresa is a correspondent, too. We are one big family on NEVADA MATTTERS INC. There are more shows to come that our correspondents are also participating in. As if being an A.M. News Correspondent were not special enough, we are now providing an opportunity for every correspondent to show their amateur talent to the world. Go the the facebook page of Talent Matters and get all of the instructions for submitting your one minute talent clip. Your talent clip will be posted on TALENT MATTERS social media including facebook, YouTube Google+ along with professional guest talent clips. This is the venue for you if you are just aching to show of your hidden talent. Only amateurs may compete but pros can submit guest clips to also be played on our new Internet radio show, Talent Matters, coming soon to americamatters.us. Becoming an A.M. News correspondent has been such a special experience and it keeps getting better. Everyone gets to tell their ‘local’ story, share their special and unique activities. Connecting and networking with other worldwide correspondents can be fascinating and eye opening. Here’s what I think about all of this. Let’s connect everyone in the world. Let’s share important information and have some fun doing it spending up to three hours a day together, Monday through Friday. It will become more apparent that we are all one family, the human family. As we get to know each other better, we will be able to make a better world. This planet is our home, everyone’s home. As Lawrence R. Gelber founder of #IDWP would say, I Declare World Peace. I have always loved saddle shoes, had them in high school and still have a pair now. Once again, the ‘traditional’ food of bone broth is proving itself to be an essential, affordable nutrient. In my own ‘Back to Basics’ project, I am repeatedly finding that traditional foods and ingredients are invaluable to healing and health. Check out this Norm’s Farms Elderberry Review where I (Jessica owner of www.deliciousobsessions.com) discuss Norm’s Farms natural elderberry products. Elderberries are great immune boosters. Back to basics, again. (By now you probably know I have a project and a facebook page called ‘Back to Basics’). It is becoming more specific about what basic is. It is about the revival and creation of healthy traditions. These traditions involve producing, gathering, preparing and eating foods in ways that were practiced to an extent for centuries and existed even thousands of years ago. They kept our ancestors alive, strong and healthy. Those who came before us were eating nutrient dense food and we can again, too. Well, elderberries are one of those foods that have been around forever. They were gathered and used very similar to the way they are today. In fact, Roger Lenhardt, son of the original ‘Norm’ explained to me that the purple dye used in the pre-historic cave paintings came from elderberry. You can’t get much more traditional than that with a plant. In addition, "The elderberry is a great case where modern clinical studies are actually starting to confirm what ancient alternative healers have known for hundreds, if not thousands, of years — the elderberry improves immune response." Just in case you had any doubt about how spectacular Norm’s Farms elderberry products are, here is something that equals thousands of words. The only thing more would be a taste. You will have to place an order to do that. Tigernut milk is a traditional Nigerian drink made from the nutrient-dense tuber, Tigernut. It’s easy to make, with a flavor like chestnuts. In order for us to consume nutrient dense food rather than nutrient dead food, we need to revive traditional foods. Here is a drink made from TigerNuts, a food found to exist as far back as in ancient Eqyptian days. During my last visit to Los Angeles, in March, I chronicled my meals by the dietary restrictions of my dining companions. For breakfast one day, I ate in Los Feliz with four friends who were varying degrees of gluten-free. One had suddenly discovered a gluten intolerance, while another felt it would be better for her pregnancy. I ordered ricotta pancakes — and enjoyed each glutinous bite. There are and have been so many ‘health fan diets’ over time that one can become dizzy, even sick over what to eat.